Who exactly was it that came up with the term “Blue Danube”? Well, if memory (could be in trouble now) and research are our guides (best bet), we’re guessing it had something to do with that Austrian fellow, Johann Strauss II. “An der schönen blauen Donau” is the title of the waltz composed in 1867 by Strauss, commonly known in English as “On the Beautiful Blue Danube”. From our adventure on the Danube (known in German as the Donau); we would agree with Johann that the Danube is beautiful… but blue? More brown, like a mud-puddle, if you ask us. Anyway, that’s all beside the point really, as our eight-day Romantic Danube cruise with Viking River Cruises, aboard the Viking Europe, from Nuremberg, Germany (Nurnberg in German) to Budapest, Hungary, turned out to be one of the most scenic and historically fulfilling trips we’ve taken. 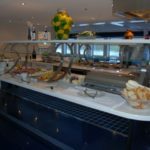 If you haven’t taken a Danube river cruise, some of the reasons to consider this trip are: small, three-deck ships designed for the rivers they are sailing (approx. 150 passenger capacity); unpack once (added bonus: all cabins have a window of some kind); no seat assignments and only one restaurant for meals (we relish being able to chose our own dining companions at each meal); planned daily activities (most shore excursions are included in the price); sailing through the spectacular scenery of Germany, Austria, Slovakia and Hungary. 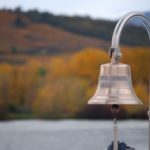 Cruising the Danube (second longest river in Europe at 1770 miles/2850 km), which rises in Germany’s Black Forest and flows into the Black Sea, turns out to be one of the most relaxing ways to get up close and personal with the history of Europe’s charming towns and quaint villages. Although the occasional large city is thrown into the mix of ports-of-call (who doesn’t want to visit Vienna at least once anyway? ), sightseeing excursions of the charming towns of Kelheim, Regensburg (with an included excursion to Weltenburg Abbey), Passau and Melk (with its Benedictine Abbey), keep passengers busy and entertained. Boarding the Viking Europe in historic Nuremberg (second-largest city in Bavaria) for the cruise along the Danube, passengers from the United States, Australia, Canada and Great Britain, met for a week of sightseeing and relaxation. Our second day offered a four-hour sightseeing bus and walking-tour of Nuremberg. English speaking guides easily grabbed and held our attention as they led us onto the Zeppelin grounds where Hitler held his Nazi party rallies; stood with us outside the Palace of Justice (the historic home to the Nuremberg Trials) and pointed out the exact windows of the building where the trials took place; walked with us from the castle to the Old Town, whilst explaining that Emperor Heinrich III founded the city in the 11th century as a base for his campaigns in Bohemia; then allowed us plenty of free time for browsing and shopping at the market in the Main Market Square. Returning to the ship, we headed for lunch while the Captain and crew prepared for departure. 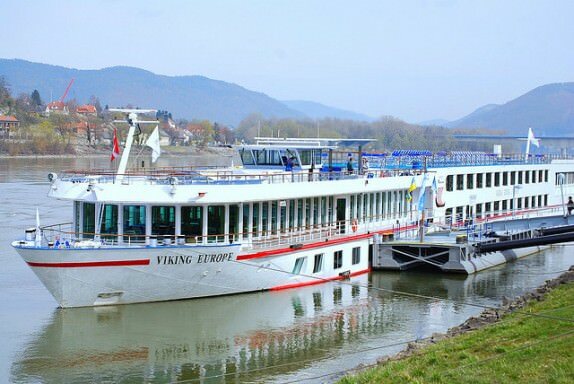 Anchors aweigh and the Viking Europe set sail along the Main-Danube Canal, destination Kelheim, situated at the confluence of the rivers Altmuhl and Danube. On board lectures focusing on the European Union and Main-Danube Canal, enlightened passengers who chose to attend the afternoon and evening presentations, while live music and dancing in the lounge finished off the night. Day three saw an early morning docking in Kelheim. It had snowed quite heavily the night before (not typical for the end of March), but provided for a very picturesque landscape. Although we had hoped for spring weather conditions, the falling snow brought about the romance of the Danube and nearby villages. Off the ship and onto tour buses, we were whisked away to board a small river boat, to cruise where the river Danube has carved through the hard limestone rock of the Swabian Alb (to create the stunning Danube Gorge) and pay a visit to the baroque abbey at Weltenburg (the world’s oldest monastery brewery – since 1050). 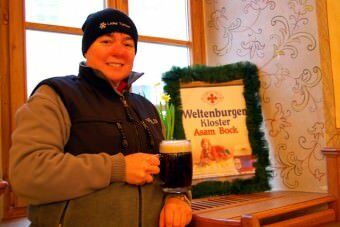 After a tour of the Abbey and history lecture given by our guide, it was time to taste the famous Weltenburger Kloster Barock Dunkel, which received the 2004 World Beer Award for best Dunkel beer (dark ale) in the world. After our four-hour excursion, we re-joined the Viking Europe, which had sailed on to Regensburg. An afternoon guided walking tour of the large, medieval center of Regensburg (a Unesco Heritage Site which dates back to the Stone Age and is located at the confluence of the Regen and Danube rivers), was both gratifying and informative. The city teems with history and architecture, such as: the Gothic Dom (Cathedral) founded in 1275; the medieval Stone Bridge (constructed from 1135-1146) used by the knights of the 2nd and 3rd crusade to cross the Danube on their way to the Holy Land; the Town Hall dating from the 14th century and containing the rooms occupied by the Imperial diet (in German also known as Reichstag or parliament) from 1663 to 1806. 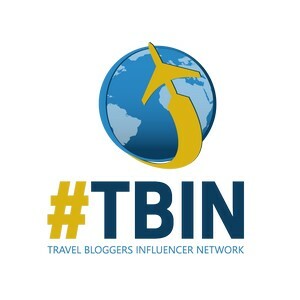 As the ship remained docked in Regensburg until late evening, there was ample time to continue exploring, find a local restaurant for dinner to savor the local specialties, or stay onboard for dinner and Bavarian folklore entertainment. Docking early the next morning, we arrived in Passau, with its baroque and Gothic architecture. Known as the Dreiflüssestadt (City of Three Rivers), Passau was our last port of call in Germany before the Danube flowed into Austria. A full day in port proved ample to explore this city where the Danube, Ilz and Inn rivers meet. 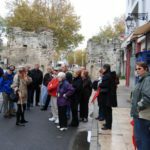 Our guided walking tour of the Old City (with seven-thousand years of history) and St. Stephen’s Cathedral (the organ is the second largest in the world with 17,774 pipes), concluded with a visit to the Glass Museum (the world’s largest museum of Bohemian glass, with 30,000 pieces dating from 1700-1950). 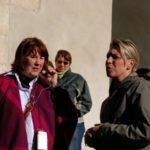 Our guide, Ingrid, advised passengers in her group where to enjoy the finest cakes and coffee, which sausage to try and most importantly, where to find the best Apfelstrudel in town. 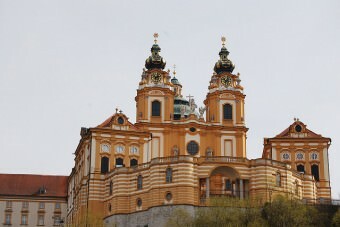 By evening the ship was sailing onwards to the little town of Melk, an important spiritual and cultural center in Austria for over 1000 years, but probably best known for the massive baroque Benedictine monastery called Stift Melk. A guided tour on day five of Melk Abbey (home to a school since the 12th century and home to an extensive medieval manuscript collection), provided splendid views of the Wachau valley and river Danube. 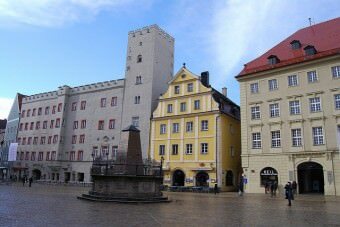 A short, down-hill walk from the abbey and the Hauptplatz (town square) and Hauptstrasse (main street), with buildings from the middle ages, were reached. 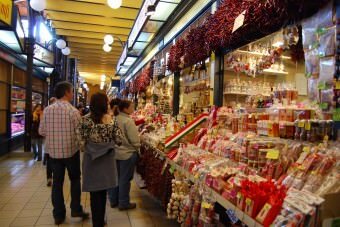 Here it was possible to tempt the taste buds with Austrian delicacies (chocolates with apricot, cakes, pastries) or spend time shopping for the perfect souvenir. Arriving back on board for lunch, the ship set sail on her six-hour voyage to Vienna (in German, Wien). An overnight docking in Austria’s capital city saw some passengers heading into the city to dine and explore Vienna on their own. Morning of day six started with a half-day bus tour of Vienna, stopping to visit the Belvedere Palace (view The Kiss by Gustav Klimt) and ending at the gothic and Romanesque, St. Stephen’s Cathedral (Stephansdom). Vienna has so many famous sights, such as the Opera House, Stadtpark, Hofburg Theatre and Ringstrasse; expect your head to be on a swivel during a bus tour. Deciding to stay in the city after the tour ended, we discovered Restaurant Ferdinandt, near the shopping area of the Kartnerstrasse (main pedestrian zone in Vienna lined with shops and restaurants) and Stephansplatz (a square at the geographical centre of the city) to have lunch and sample the Ottakringer beer from Vienna’s only brewery. The restaurant offers many regional specialties, of which we highly recommend the Karntner Kasnudein, a regional dish of dumplings stuffed with cheese and spinach, with a brown butter and fresh sage sauce… to die for and only Euro 14.90. After lunch, it was time to do what the locals do… find a coffee shop and eat cake. The Kurkonditorei Oberlaa turned out to be a perfect place to indulge in the famous Sacher Torte (a dry chocolate cake with apricot jam) and Viennese coffee (forget Starbucks, Vienna is where the coffee shop began). Although we did not try the original Sacher Torte from the Sacher Hotel, our choice was most delicious. Leaving Vienna on our final evening of cruising, the scenery was breathtaking. The ship cruised between the foothills of the Carpathians (largest mountain range in Europe), past Bratislava (an amazing sight at night), capital of Slovakia and onward to Budapest, capital of Hungary. Early morning came quickly on day seven and most passengers headed up to the sundeck, not wanting to miss the approach into Budapest, Queen of the Danube. After breakfast a three-hour city sightseeing excursion (clarifying the unification of the right-bank (west) Buda, Obuda (Old Buda) and the left-bank (east) Pest), toured the main landmarks and attractions: the neo-Gothic Hungarian Parliament building; Szechenyi Chain Bridge; Matthias Church; Margaret Island; Castle Hill, Fisherman’s Bastion and the Castle District; Esztergom Basilica; Heroes’ Square. For those who wanted more of the city and her sights, the afternoon was free to explore as you wished, allowing plenty of time to shop on the famous Vaci Utca with all its fashion boutiques, cafes and expensive restaurants (main shopping street catering to tourists), or scour the Great Market Hall (Budapest’s largest indoor market) for popular souvenirs of paprika, tablecloths, dolls, glasses and clothing. 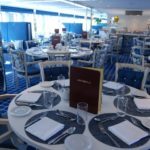 With the opportunity to spend the last evening of the cruise in port, it is a great excuse to savor the local cuisine (goulash being a favorite of mine) at a nearby restaurant. Along Vaci Utca the choices are endless, but a couple of recommendations are: Fatal Restaurant, serving authentic Hungarian food in a Hungarian-countryside atmosphere (popular with locals); Bangkok Thai Restaurant serves very good Thai food at reasonable prices. The final morning was relaxed and calm, with disembarkation only taking a few minutes. Saying good-bye to new-found friends and making plans to meet again took much longer. The small ship experience and sailing the Romantic Danube brought with it priceless memories to last a lifetime. Viking River Cruises – offers cruises to Europe, China, Russia and Ukraine. The Restaurant Ferdinandt in Vienna, Austria has a wonderful lunch menu with delicious options that are reasonably priced. 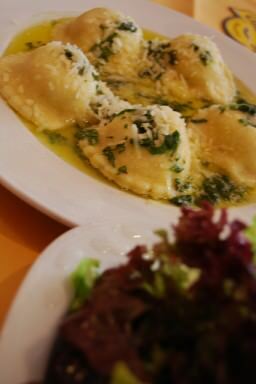 WJ recommends the Karntner Kasnudein, a regional dish of dumplings stuffed with cheese and spinach, with a brown butter and fresh sage sauce – E14.90. Chase it down with a local beer: Zwickl beer – 0.5 liter = E3.60; Ottakringer beer – 0.5 liter = E3.20. Great location near Stephensplatz and St. Stephen’s Cathedral. Address: Wiener Restaurant Ferdinandt Zwickl-Bar, Neuer Markt 2, A-1010 Wien, Austria. Open: 9AM to midnight. Outdoor seating available. 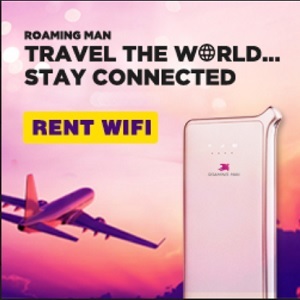 Accepts Credit cards, debit cards and cash. Kurkonditorei Oberlaa – (in Vienna) for coffee, dessert, lunch. Enjoy a slice of the famous Sacher Torte – E3.35, and a Viennese coffee – Oberlaa Mélange = E3.30. If you sit outside expect to pay the “Schlagobers Port” or waiter service charge = E0.90. Address: Kurkonditorei Oberlaa Wien, 1010 Wien, Neuer Markt 16. Fatal Restaurant – Authentic Hungarian food. Only cash in Hungarian Forint. Address: 1056 Budapest, Vaci u. 67. Bangkok Thai Restaurant – serves very good Thai food at reasonable prices. Excellent green curry and pad Thai. Address: 1056 Budapest, So utca 3.